Over the last few hours, we've been flooded with news on Crete's fires. All information we are able to give you comes from local websites, and we are currently in the south-east of the island, where the problem of fires is not present. If anyone of you lives or is currently in the northwest of the island and can share specific information from these regions, please provide them in the comments. We understand well the anxiety of those who are just going on holiday and looking for any information on this subject. You should also contact your travel agency. 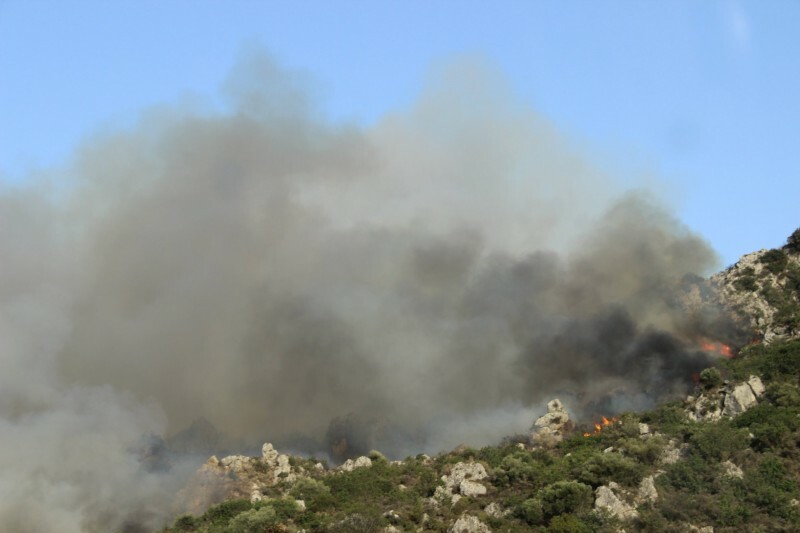 Several fires broke out in the western part of Crete in the Chania prefecture. One of the largest and the most difficult to control erupted yesterday around hours. 14 near Agios Fanourios located in the area of ​​Apokoronas. Other fires also appeared in the village of Vrisses, near Kissamos, and according to recent reports in the Kakopetros region near Platanias. In the latter town the situation turned out to be so serious that it was decided to evacuate the residents of both Kakopetros and several surrounding villages (Kotsifianas). The surrounding agricultural crops and grasslands are burning. The difficult situation also prevails in the vicinity of Apokoronas, because the fire is still being fueled by stronger winds in recent days. When it seemed that firefighters managed to control the situation, on Tuesday afternoon the fire reappeared in three different places. According to the latest official information, 60 firefighters with 27 vehicles take part in the Visses fire brigade. In Kakopetros 50 fire fighters with 15 vehicles fight with fire. The actions are also supported in the air by two helicopters that have been stationed in Crete since this year. For security reasons, traffic on the Chania-Rethymno national road at the height of Vrysses has been stopped. Vehicles are directed to the old national road. At the moment, we have not found any information regarding the restoration of traffic on the New National Road. There are no reports of fatalities yet. Although in places where there is currently fire, the situation is difficult, you can not compare what is happening in Crete to the unimaginable tragedy that takes place near Athens and on the continent. In connection with the deaths of fires in mainland Greece, Prime Minister Alexis Tsipras announced a three-day national mourning.